British Castles are trully magnificent! This comprehensive website explores the complete history of British Castles. The Ancient History of British Castles - The Causewayed Camps, Hillforts, Roman Fortresses and the Burgh Castles. The Motte and Bailey Castles, Norman, Medieval, Welsh Concentric Castles and English Castles! Life in the castles - the parts of the castles - rooms, moats, dungeons, death traps and murder holes! Medieval Weapons and Siege warfare! The Medieval Period is one of the most popular periods in English History and information and sections regarding Medieval food, entertainment, clothing, occupations have been included. Each section of this site addresses all of the questions and provides interesting facts and information about these great monuments to bygone ages. The 'flavour' and content of the different sections of the site are briefly explained in the following text. The Castles Sitemap provides full details of all of the information and facts provided about the fascinating subject of castles! English Medieval Castles - a really fascinating subject! Great stone fortresses providing a stronghold, a haven of safety! The Medieval Castles built in the Middle Ages saw many great battles. The old Medieval Castle were a symbol of wealth and power and were often the centre of historic battles and Medieval sieges! These great old castles were built for Medieval warfare and defence. The life of the Kings, Queens, Knights, Lords and Ladies were made comfortable by their servants. Who built the Medieval Castles? What was their History? What was life like in an old English Medieval Castle? Who lived in such a castle? The Lords, the Ladies and their servants. What was life like in different parts in the castle? What were the Interiors of Medieval castles like? Plumbing? Lighting? Heating? What was the furniture and decorations like in a Medieval Castle? Click the following link for facts and information about Medieval Castles and the lives and environment of the inhabitants! The History of English Castles! 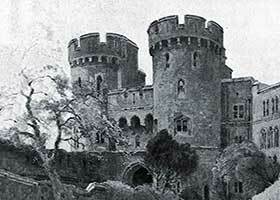 The English castles, as we generally recognise them, was built of stone during the Medieval era. But the history of the English castle goes back to the Neolithic Period - the Stone Age! Understand the history of English Castles - fascinating facts and information leading up to the construction of the English Medieval Castle. The History of the English castles, English Causewayed Camps / Enclosures and the history of Stonehenge, the Hillforts, Roman forts and constructions and the Burgh Castles built by Alfred the Great. Facts and information can be accessed in the History of English Castles. Discover the facts and info about the history of changing populations, rulers and cultures and how these led to the construction of castles. The Normans & the Motte and Bailey Castles The Battle of Hastings in 1066 marked the end of the Anglo Saxon Kings of England and the Norman Invasion led by Duke William of Normandy. William the Conqueror's strategy of utilising Pre-Built Norman Timber Castles with Motte and Bailey structures played a highly successful role when he conquered England. The early wooden Motte and Bailey castles were gradually replaced with the stone Norman castles and Keeps. Facts and information can be accessed in the Motte and Bailey Castles section. Discover the facts and info about the history and construction of the Norman castle. Medieval Knights - the people who fought for Castles! Medieval Knights and their ladies who lived in castles and fought for the castle. The passage to Knighthood as a Page and a Squire. The Medieval Knights armor and his weapons. The life of Medieval Knights and their adherence to the Code of Chivalry and Courtly Love. Medieval Tournaments! Facts and information can be accessed in the Medieval Knights section. Discover the facts and info about the life and duties of the Medieval Knights who fought for their castle. Medieval warfare include the massive siege weapons designed to demolish the castle. Medieval Siege Weapons including the Trebuchet, Ballista, Mangonel, Battering Ram & Siege Towers. Facts and information can be accessed in the Medieval Weapons section. Discover the facts and info about the terrifying weapons of the Middle Ages and how the castles was attacked! Interest in the Medieval Castles naturally progresses to the people who lived in and around them! People of the Medieval Period! What was the Feudal system which dominated the lives of everyone who lived in and around the castle during the Medieval period? Who were the Kings and Queens who owned the castle? Medieval Clothing, Entertainment, Food and Drink, Occupations, Guilds, Medieval Names and Musical Instruments. Facts and information can be accessed in the Medieval Period section. Discover the facts and info about the lives and occupations of the people who lived in and around a castle during the Middle Ages! Arthurian Legends, Castles and Myths! Fact or Fiction? Think of castles and the question that everyone asks - was Arthurian Legend Fact or Fiction? Did the legendary stories, people and the castle at Camelot featured in Arthurian Legend actually exist? Who was King Arthur, Merlin, Guinevere and the Knights of the Round Table? The legend of Camelot. Learn about the facts and also about the Medieval 'Spin Doctors'! Facts and information can be accessed in the Arthurian Legend section. Parts of Medieval Castles - Moats and Dungeons! The Tower of London - the Most Famous of all the Castles! The Tower of London is the most famous Medieval English castle. Its bloody history encompasses some of the most important events in English history. there is extensive Information about the most important of all English castles. The History, Timeline, Prisoners, Executions and Beheading, famous prisoners, Legends of the Tower, the Ravens, Traitor's Gate, the Crown Jewels and the Ghosts who were reputed to haunt the Tower of London - the most important and famous of all the castles in Britain. Facts and information can be accessed in the Tower of London section. Discover the facts and info about this famous English castle and its bloody history of death, execution and torture! Learning about the different periods of architecture will enable an immediate recognition of when a castle was built and who built the structure. This is particularly important for anyone who has an interest in Castles - which is why the 'Architecture' section has been featured on a Castle website! Neolithic, Iron and Bronze Age, Roman , Romanesque, Gothic. All styles of Architecture which influence the design and construction of castles. Facts and information can be accessed in Architecture. Discover the facts and info about the changing designs in architecture and how these changes influenced the construction of the castles.